Urban fieldwork at its finest. Frank Lab postdoc Nora Lahr measures photosynthesis on a red maple tree in a parking lot in downtown Raleigh. To their disappointment, and possibly relief, no. I am actually measuring photosynthesis of the leaves. I remind people that they learned about photosynthesis in biology class once upon a time—the process where plants take in carbon dioxide from the air and use energy from the sun to produce sugars for themselves and oxygen for us. 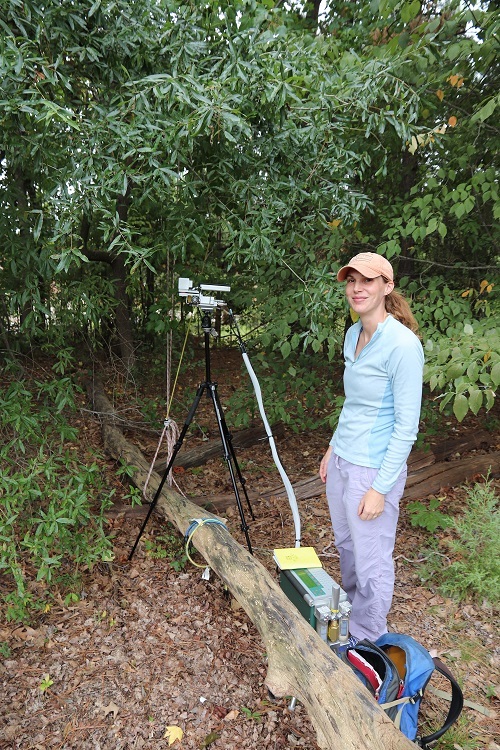 Sometimes Nora got a break from the heat and pavement in the city, and got to haul 40 lbs of photosynthesis measuring equipment into the woods. What never ceases to surprise me is the response I get to this explanation. People think that what I am doing is really cool! My own thoughts are too often on how many more trees I have to measure and whether the instruments will keep working properly, and it is nice to be reminded of why I am an ecologist, why I study trees, and why I care about helping trees grow in cities. Photosynthesis is cool! Some of this research on Raleigh trees has just been published in a new paper in PlosOne. In the paper, we showed that red maples had higher rates of photosynthesis in the city than they did at suburban sites or rural forests. This was a surprise—cities are often stressful places for trees to grow, with lots of impervious surfaces, poor soils, and frequently not enough water. When we looked more closely at the urban trees, we found that horticultural varieties (cultivars) had higher rates of photosynthesis than naturally occurring (wildtype) red maples. Does this mean we should plant more cultivars in cities because they will grow faster? The story the data told us was not quite so simple. Wildtype trees had lower rates of photosynthesis, but they were more efficient at using water, which means they may have an advantage when water is limiting. To understand this tradeoff, you can think about cultivar and wildtype red maples as two different models of dishwashers1. Yes, you did read that correctly! Say that Dishwasher #1 does a full load of dishes in half the time as Dishwasher #2, but it uses more water and energy. If only a limited amount of water is available, and our fast-but-wasteful Dishwasher #1 stops mid-cycle when the water runs out, would it give the desired outcome (a clean load of dishes)? Wouldn’t you rather wait for the dishwasher that needs less water and eventually gives you clean dishes? Over a tree’s lifetime, this tradeoff between photosynthesis and growth, and water usage, is important when it comes to putting the right type of tree in the right place. 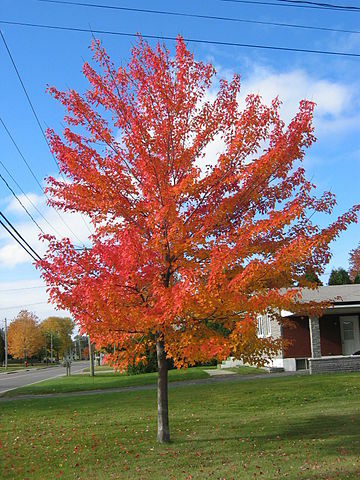 Red maples make beautiful street trees, and cultivars are valued because they have a uniform appearance and colorful autumn foliage. But several studies now show that cultivars do better when they receive more water, which is not always easy to provide in cities. In sites such as property buffers or park medians, wildtype trees may be a good choice because of their water-use efficiency. Wildtype red maples grown from local sources may also be better matched to regional environmental conditions. What does all this mean? Well, one of the next steps involves identifying which types of red maple cultivars may have this tradeoff between photosynthesis and water-use efficiency. Then, we will have a better idea of what trees to plant in cities. I am measuring photosynthesis of different types of red maple seedlings and of street trees surrounded by different amounts of impervious surface in two ongoing experiments in the Frank Lab. So this summer, if you see someone on your sidewalk, with strange-looking equipment and bungee cords around a tree, go surprise them by asking if they are measuring photosynthesis! Lahr, E.C., Dunn, R.R., and Frank, S.D. (2018) Variation in photosynthesis and stomatal conductance among red maple (Acer rubrum) urban planted cultivars and wildtype trees in the southeastern United States. PLOS One: 13(5): e0197866. 1 Nora came up with the dishwasher analogy. She wasn’t sure it made sense. Annemarie read it. Annemarie fixed it. Now it makes sense. This is just another example of how Annemarie keeps EVERYTHING running smoothly. Thanks Annemarie! 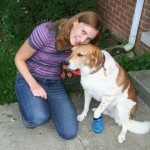 I study tree ecology and physiology, from street trees to natural forests. At NC State, I am investigating tree water stress in response higher temperatures by measuring a suite of physiological variables for urban and rural trees with contrasting life history strategies.